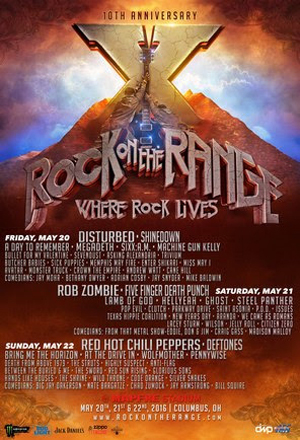 The daily band lineup has been announced for the 10th annual Rock On The Range--the largest and most-acclaimed rock festival in the United States--May 20, 21 & 22, 2016 at MAPFRE Stadium in Columbus, OH. As previously announced, tickets for the festival are SOLD OUT, marking the fourth year in a row that tickets have sold out in advance. However, as part of a partnership with the Ohio Lottery, ROTR fans have the chance to purchase a limited number of single day tickets to the SOLD OUT event at face value. For more information and to take advantage of this amazing offer courtesy of the Ohio Lottery, go to facebook.com/ohiolottery. The incredible music lineup features the legendary Red Hot Chili Peppers, hard rock titans Disturbed (who have returned after a 4-year hiatus), and rock icon/filmmaker Rob Zombie topping a lineup that’s packed with rock royalty such as Deftones, Shinedown, Five Finger Death Punch, Bring Me The Horizon, A Day To Remember, Megadeth, At The Drive-In, Lamb Of God, SIXX:A.M., Hellyeah, and Pennywise, along with the genre’s hottest developing artists. With three days of music on three stages, sets from rock’s favorite comedians in the ROTR Rolling Rock Comedy Tent, The Music Experience, a Craft Beer Village featuring top breweries from the region, the Rock On The Range Photo Gallery, new art installations, and unique onsite activities, Rock On The Range sets the standard for American rock festivals. VIP Experiences: The Jack Daniel’s Old No. 7 Club is the ultimate way to experience Rock On The Range. VIP ticket holders will have access to: ice cold Jack Daniel’s cocktails (21 & up), shaded tents with seating areas, direct view to main stages, video screens, private bars, upgraded food vendors, private restrooms, and WiFi and charging stations. John Varvatos: We are excited to announce an exclusive partnership with famed American fashion designer John Varvatos to create the exclusive Rock On The Range 10th Anniversary t-shirt. Available in both men's and women's, the limited edition anniversary t-shirt will only be available only at ROTR. Rock On The Range Photo Gallery: The Rock On The Range Photo Gallery will feature photos from a variety of talented photographers that have captured unforgettable moments in the history of Rock On The Range. The gallery is being curated by photographer Rob Fenn and promises to be a must-see at the festival. Download the Rock On The Range mobile app (available for FREE via iTunes and Google Play) for festival information and band performance times.